While it’s well documented that British Folk Music’ isn’t the first category I go to for a good time; I can still appreciate it when I hear something different from the ‘finger in the ear’ sea-shanty’s that I was force fed as a youth. 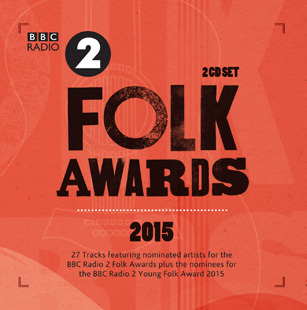 In conjunction with the actual BBC Folk Awards ceremony Proper Records are releasing this 27 track album featuring artists that are nominated for awards and also a couple of bonus tracks from four young up and coming bands too. Of the names I recognised, I love Cara Dillon’s Moorlough Mary which opens the compilation; it holds absolutely no surprises but is the epitome of Folk music and her voice is possibly the sweetest in the business these days. I always have a soft spot for Folk Music from my own local area in the North East of England; so I was delighted to hear Jez Lowe included; singing his ode to the Pitman Painters from Ashington in Northumberland. Rising stars The Young ‘Uns get to showcase why they are on everyone’s radar from BBC Radio 2 to the young Festival goers who normally avoid these things like the plague. Their ode to John Hill who dies in the fields of Flanders is both beautiful and timeless and bears seeking out. Alongside household names like Loudon Wainwright III, Julie Fowlis, Peggy Seeger, Martin and Eliza Carthy there are several absolute gems waiting to be discovered; such as O’Hooley & Tidow’s superb Two Mothers, Kathryn Tickell and the Side’s The Prior’s Standard which takes on almost classical phrasing; but still sounds amazing. Other pleasant surprises are the duet between Martin Green and the extraordinary Becky Unthank; which could easily come from a Disney cartoon; and Wildwood Kin, who are a Young Folk nominee held ne entranced with The Valley, which certainly bodes well for their musical future. So, and this won’t come as a surprise, Folk Music is alive and well and still spawning babies that will keep this much maligned genre into the middle of the 21st Century.